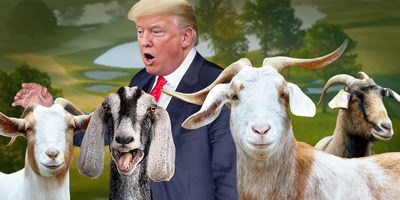 Getty; iStock; Skye Gould/Business InsiderPresident Donald Trump’s golf club in Bedminster, New Jersey, keeps goats on the property as a way to qualify for a tax break for farms. A goat herd is helping President Donald Trump pay thousands of dollars less in property taxes on his New Jersey properties, thanks to a state law designed to benefit farmers. The Wall Street Journal estimated in 2016 that Trump paid less than $US1,000 a year in property taxes on land that would typically require roughly $US80,000. President Donald Trump is able to pay tens of thousands of dollars less in property taxes on his New Jersey golf courses because of a goat herd, according to The Wall Street Journal. Citing public records, The Journal reported in 2016 that Trump had been able to save thousands of dollars in property taxes on his two properties in Bedminster – where he is this week for a “working vacation” – and Colts Neck. Because the properties have a goat herd, as well as hay farming and woodcutting, New Jersey law permits them to receive a farmland tax break. Therefore, Trump pays reduced property taxes on the parts of his golf courses dedicated to farming, the report says. Trump National Golf Club in Bedminster maintains 113 acres of hay farming and eight goats, and the property in Colts Neck has 40 acres of hay production and trees, The Journal reported, citing tax-break applications reviewed in 2016 during the presidential campaign. The Journal estimated that Trump paid less than $US1,000 a year in property taxes on land that would typically require roughly $US80,000. The farmland-assessment program Trump is benefitting from was added to the New Jersey Constitution in 1963 to prevent overdevelopment in the already crowded Garden State, the report says. The tax break is both popular and controversial in New Jersey, a state that has some of the highest property taxes in the country and is trying to maintain a semblance of its agricultural history as its population density continues to rise. At the time of the Journal report, Trump’s New Jersey properties, both of which are in wealthy areas of the state known for their horse farms, had last been approved for farmland assessments in 2015. It’s not the first time Trump has received a tax break for one of his properties. Trump famously received massive tax breaks from New York City on some of his most notable real-estate projects, including Trump Tower and The Grand Hyatt.